This unit will accept 237DNI inserts for notching rounds, squares, rectangles, and special shapes of tubing and pipe up to 2" standard (2-3/8" OD x .154" wall). The die will notch both walls of one tube end in a single press stroke. The unique self-contained, spanker style design requires a minimum 3.5" stroke to operate and with no mounting to press ram required, larger stroke presses can be used. Die design also allows for tool area to hang over the press bed so you can notch bent piece parts. Along with standard 90° radius notches, custom configurations are possible. 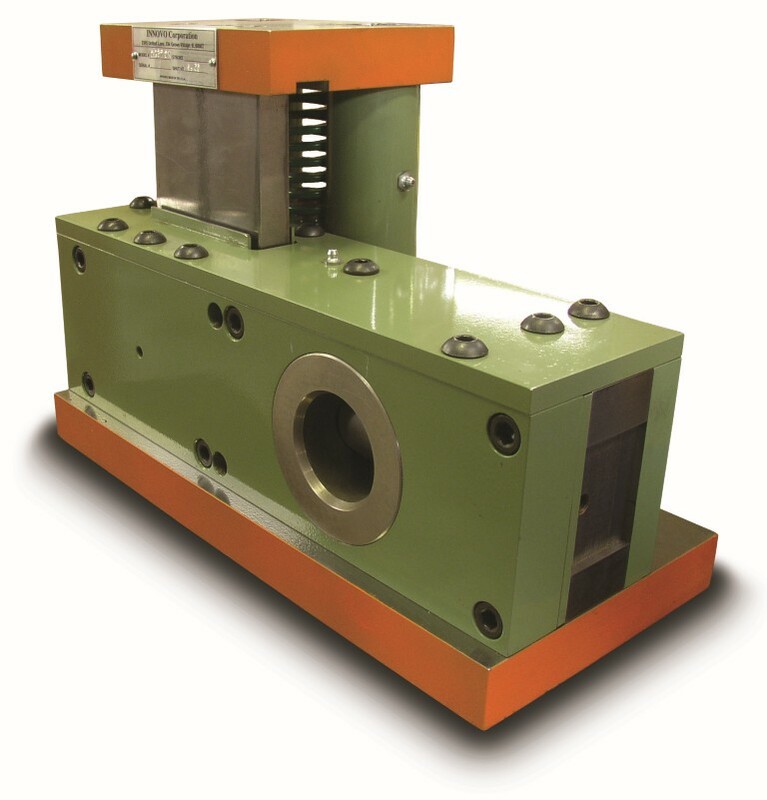 Unit can be used in a mechanical press, stand alone hydraulic press we offer (see Press Section for available options) or can be furnished as a hydraulic unit as illustrated below. This unit will accept two sets of 237DNI inserts for notching rounds, squares, rectangles, and special shapes of tubing and pipe up to 2" standard (2-3/8" OD x .154" wall). The die will notch both walls of one tube end in a single press stroke. The unique self-contained, spanker style design requires a minimum 3.5" stroke to operate and with no mounting to press ram required, larger stroke presses can be used. Die design also allows for tool area to hang over the press bed so you can notch bent piece parts. Along with standard 90° radius notches, custom configurations are possible. Unit can be used in a mechanical press, stand alone hydraulic press we offer (see Press Section for available options) or can be furnished as a hydraulic unit as illustrated below. Standard Units are right hand as shown in picture. Left hand units available upon request. Cam protrudes past bottom of die shoe requiring risers to be added or openings in press bolster to suit. Slugs pass through bottom of die shoe, requiring risers or openings in press bolster to suit.